Boston built the first subway in North America. Trolley car grid-lock and street congestion on main thoroughfares motivated the Massachusetts Legislature to authorize the construction of the subway. It opened on September 1, 1897. 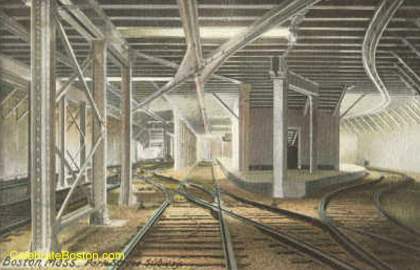 The original "Green Line" went underground at the Public Garden and returned to the surface near North Station. Park Street Station was the terminus for many southern streetcar lines, and Adams Square Station (now demolished) was the terminus for northern trolley lines. The "cut and cover" method of construction was used, with a deep trench dug or "cut" on Tremont Street, and a steel structure built around it and then filled in or "covered up." The Budapest Subway, and the later Paris Metro, were visited by the Boston subway designers. This view above is of Boylston Street Station looking South. A view looking north on Tremont Street. 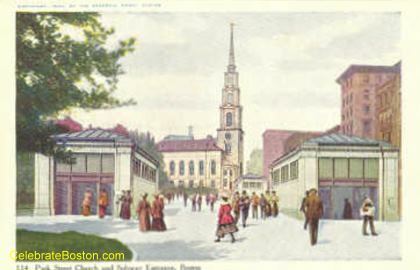 Boston Common is on the left, with Park Street Church in the center. One of the few areas of the downtown that has not changed very much in 100 years. 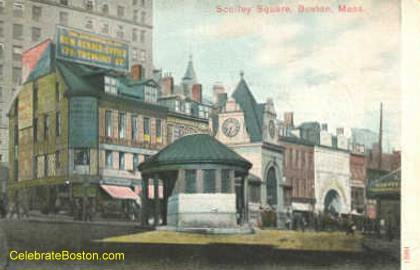 A view of the original entrance to Scollay Square Station. Note the splendid clock tower. This building was torn down in the 1920s or 1930s and replaced with an entrance of only granite walls with no roof. Scollay Square, originally a center of commerce, became a burlesque area and was torn down in the early 1960s to build Government Center. 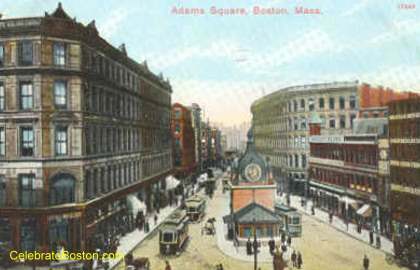 When constructed, Center Plaza physically eliminated both Scollay Square and Adams Square (Tremont Street to Faneuil Hall). A view of Adams Square and the beautiful entrance to the subway. This view is looking north up old Washington Street. The entire area was demolished in the 1960s and replaced by Boston City Hall and Government Center Plaza. The statue of Samuel Adams that stood where the subway entrance is, now stands at Faneuil Hall opposite city hall. Behind the tower at 28 State Street today, near the Old State House, is approximately where this view was taken.